I’m here to announce a new CONTEST! This contest is open to everyone and you will have 2 chances to enter, see details below. As I announced in May on the Vivien Leigh.com Facebook page, TCM (Turner Classic Movies) has chosen to feature Vivien Leigh as their Star of the Month in September. 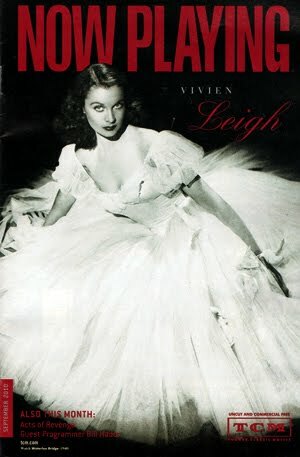 Every Tuesday evening in September, Vivien Leigh films and documentaries will air! In total, 15 events and 2 documentaries are scheduled. Thanks to TCM, I have 5 beautiful Viewer Guide booklets to giveaway to you! The 33 page booklet features Vivien Leigh on the cover, an article about Vivien Leigh written by Robert Osborne, and listings of the films, documentaries scheduled to air on TCM in the month of September! 1) Simply leave a comment and tell me which of the Vivien Leigh films TCM has chosen to play in September is your favorite. Giveaway ends Tuesday August 31st at 8 p.m. EST. Five winners chosen by Random.org.